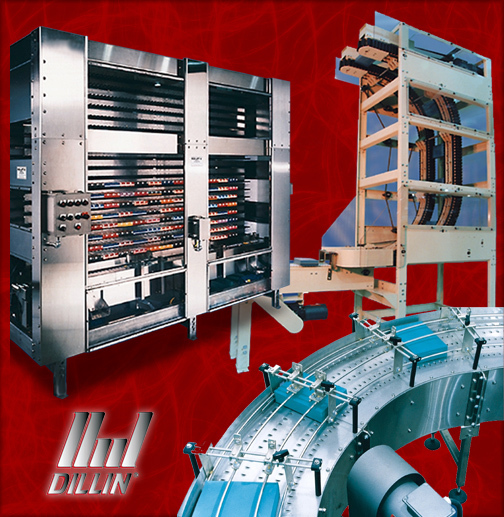 For over 40 years Dillin has served its customer's through the application of its patented ROE-LIFT® Over-The-Top® Vertical Accumulators and AIR DECK® Conveyors with QuickSet® Guides both domestically and worldwide.We specialize in systems for automated packaging lines, robotic tray packing, case packing, and palletizing. We design and manufacture state-of-the-art equipment that accumulates, conveys, diverts, elevates, flips, lowers, merges, stops, rotates, and transfers. Dillin’s Systems come fully supported both mechanically and electrically with optional installation assistance (Supervision) as well as line debug and production start-up assistance. Our field service technicians can provide operator and maintenance training as well as trouble shooting tips. During the equipment’s one (1) year, warranty period Dillin will send out both mechanical and/or electrical technicians to address any issues and get you back up and running.